While we have already reviewed plenty of Joker-themed slots including the 5 Line Jokers slot machine and the Power Joker slot machine (which have both been developed by Novomatic), you’ll struggle not to be enticed by these dazzling reels as you find yourself spinning the night away under disco lights. Initially released as an exclusive title at Mr Smith Casino, the Joker Pro slot machine can now be enjoyed at all online casinos offering Net Entertainment games. 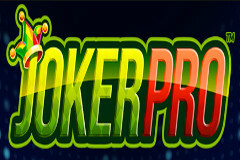 While most of their titles are 5 reeled slots, Joker Pro is one of their few titles containing 10 non-adjustable paylines which will be music to the ears of those of you who have smaller bankrolls and like to play for low stakes as you can stake between 1p and £10 on each of these paylines, meaning a minimum stake of 10p and maximum stake of £100 is available. With shiny 7’s, ringing bells, dazzling diamonds and lucky four leaf clovers among the symbols filling the reels, you may be assuming that Joker Pro is traditional slot which belongs back in the 1980’s like the glitzy purple lights in the background, but nothing could be further from the truth. Boasting a high RTP of 96.80%, Joker Pro offers players the opportunity to win up to 100,000 coins and it’s easy to see why when you scoop Hot Spin wins and trigger Joker Pro Re-Spins – they’re not to be laughed at! Be warned, you may find yourself getting into the party spirit as you spin the reels of Joker Pro as an energetic soundtrack accompanies the reels spinning. Speaking of the reels spinning, blink and you’ll miss them as they fall almost instantly once you click on the spin button. You’ll also notice that the reels shrink if they are left idle, but once you hit to spin them they expand to fill the screen – simple yet slick! A flaming Wild symbol brings some heat to the disco but it’s the dazzling diamonds which are worth the most as they bring you up to 200 coins. Next up is the trio of 7s as these are worth up to 100 coins, there are classic bar symbols worth up to 80 coins, you’ll hear bells ringing to the tune of up to 60 coins, finding lucky horseshoes see up to 50 coins added to your balance, while lucky four lead clovers are the least valuable of all but will reward you with up to 40 coins. It’s rare for these types of traditional slots with a modern twist to include free spins features and pick me games which will alienate many of you who are used to the plethora of bonus intensive slots which have been released over the last decade, however Joker Pro does offer something a little extra in the base game to maintain your excitement under the glitzy disco lights. Once the Joker hat (Scatter symbol) lands on the second, third or fourth reel it will activate Joker Pro Re-Spins. This sees the first and fifth reels turn completely Wild as the Scatter symbol you triggered the feature with becomes a Sticky Wild. The reels will then re-spin with the same thing happening if you land yet another Scatter symbol, but you’ll also have the chance to scoop fiery Hot Spot wins too. As your re-spins take effect you’ll notice that three Hot Spots are added to the second row of the second, third and fourth reels as the symbols are laced with flames. The aim here is to land a Scatter symbol in each of these positions, and while it’s a very tough feat, doing so will see you win 1,000x stake! It might have a Joker theme, but there is certainly no clowning around on the reels of Joker Pro as huge wins of up to 1,000x your stake are up for grabs should you line up three Scatters in the flaming Hot Spot positions during the Re-Spins feature. While you’ll see plenty of flames flare under the disco lights, there is no need to be concerned about it burning a hole in your pocket as the stakes are very low so get your dancing shoes on and spin the night away boogying around your room in celebration of dazzling wins!